Temperance indicates that you are learning to bring about balance, patience and moderation in your life. You have been able to take the middle road, avoiding extremes and maintaining a great sense of calm in your life. You have learned to keep calm in situations of great stress or anxiety, and you give the impression of being a swan, paddling madly underneath the water but appearing so graceful and elegant on the surface. You do not let things get to you, and you have found a place of peace where you can put things into perspective when things get hectic. Your respect for balance and tranquillity is what will help you to achieve and experience fulfilment in your life. Your temperament will be well balanced and you demonstrate good management and balance in your outlook on life. 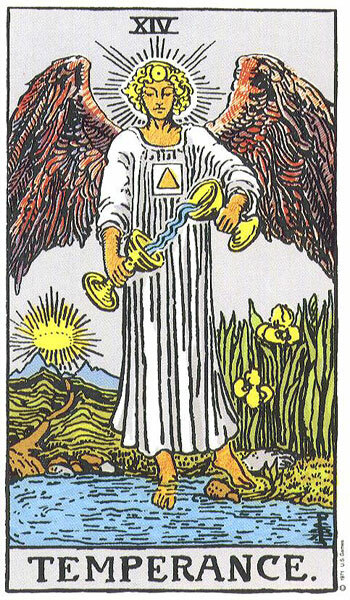 The Temperance card reflects that you have a clear, long-term vision of what you want to achieve. You are not rushing things along; rather you are taking your time to ensure that you do the best job you can. This card also reflects a higher learning in what you are doing and demonstrates that you are learning a great deal on your journey. You are at peace with what you are doing and it is all coming together very well. Your inner voice is guiding you gently to the right outcome and you are patiently listening and following. You have a very balanced perspective on the situation at this time and you are in a very good position to make the right choices.